Velo Bleu (blue bike) refers to the system of on-the-spot bike rental that allows residents and visitors to pick up a bike at one station and return it to another. There are now 175 stations all throughout Nice and Cagnes-sur-Mer extending the length of the Promenade des Anglais from Nice Airport to the Port and beyond. You can download a map of the Velo Bleu stations here. 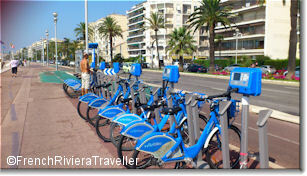 The cost of Velo Bleu rental is extremely reasonable, especially when compared with renting through a bike shop. Prices are: €1/day; €5/week; €10/month. The first 1/2 hour is free and the number of times you can access the bike within the paid period is unlimited. You can rent a bike at any bike station by calling the number listed. Obviously, a cell phone call is a lot cheaper for locals than for a visitor paying global roaming charges. When you call the number, you can choose English as a language and then you'll punch in your credit card numbers and receive instructions for how to rent the bike. Some stations (at the train station and along the Promenade des Anglais) allow you to use your credit card for renting the bike but you must have a 4-digit PIN. The easiest approach is to stop at a Velo Bleu office, pick up a map of the Velo Bleu stations, get detailed instructions and the latest info. The office is at 17 ave Thiers, near the train station. Opening hours are Mon-Fri 8am-7pm, Sat 8am-3pm. If you have an smartphone, download the Velo Bleu app which will give you real-time availability of the bikes. This is crucial as you may not be able to pick up or drop off your bike exactly where you wish during busy holiday periods. The Velo Bleu website also gives you real-time availability. A word of caution: Although it's a great system, there are maintenance issues. Inspect the bike carefully before choosing it from the rack as many are broken. The rack's electronic system also malfunctions on occasion. It's unwise to rely on Velo Bleu if you're in a hurry. Also, be aware that the bikes are sturdy and somewhat heavy. They're fine for getting up and down the Promenade and around the town center but you'll be huffing and puffing if you pedal up Nice's hills.